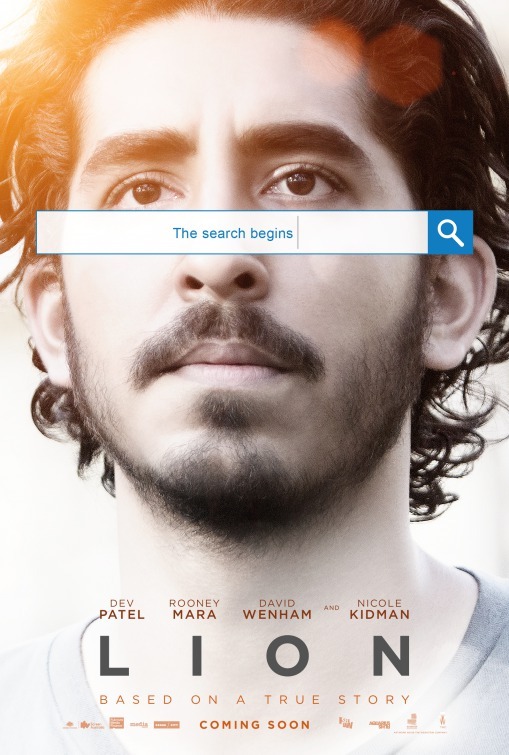 With HUGE thanks to Show Film First Australia, I got the chance to watch LION, the beautiful and touching story of Saroo Brierley and his journey towards finding his lost family. The movie is based on the non-fiction book A Long Way Home, which documents Saroo’s life as a young boy, losing his way home, and finding a new life in Tasmania, Australia. With the knowledge there’s a past waiting for him, Saroo sets out to retrace his steps from that faithful night, when he accidentally got on a train that took him thousands of kilometres away from his family. I didn’t go into this movie blind (I did watch the trailer! ), but I went in with very limited knowledge about Saroo Brierley’s truly moving story. I do recommend this approach and was rewarded with a heart-warming story that made me sob like a baby. The greatest part was not knowing what would happen next — would Saroo be able to find which station he jumped on the train that faithful night? Will he ever tell his adopted parents that his heart yearns to seek his missing family? Will he find his mother, brother and sister? All great questions that are answered in the movie, but I think going in not knowing what the outcome was added that extra depth and investment in Saroo’s journey from my end. Dev Patel (you may know him as the guy from Who Wants to be a Millionaire), did an amazing job at playing the old Saroo — and can I just say how absolutely convincing his Aussie accent in? I was floored! My friend told me that Dev didn’t take on any other roles for 8 months, so he could practice and maintain the accent. Well freaking done, because he knocked it out of the ball park. I think he does a better Aussie accent than me! While Dev was amazing, the CLEAR standout was the child actor that played little Saroo, Sunny Pawar. O.M.G, this kid can act. He was moving, funny, adorable and I just wanted to give him so many hugs for everything that he went through. It just stuns me the life that real Saroo had, and the way his own life was up-ended because he was looking for his brother and stepped on the wrong train. SO MANY TEARS. I just can’t express in enough words how much this movie moved me. It was a true show of perseverance, of love, family and the discovery of a past that shapes you into the person you become in your future. LION is absolutely a must watch. Do yourself a favour and book your tickets now. Oh, and bring tissues. LION is out in cinemas across Australia on Thursday, 19 January 2017. The film picks up right where the last movie left off. So if you haven’t seen the first one, you’ll probably have no idea what on earth is going on. Actually, if you’ve read the second book, you’ll probably still be feeling the same. Out of the Maze and unsure what’s going on, the Gladers (or what’s left of them) have been rescued from WCKD by resistance fighters. Or have they? Now in unchartered territory, they’ll have to fight for their lives on the open roads of a desolate landscape as they race to find answers. But will they be prepared for the secrets these answers will uncover? From the very beginning, it’s clear this movie is not sticking directly to the book. Scenes are shortened or cut completely, certain character’s motivations and actions change and there’s less gore and overall death. But the change? Not a bad thing. The movie does a much better job at keeping things concise, and actually explaining things, something the book often failed to accomplish. Scorch Trials is a much more fast-paced thriller than its book counterpart, and I enjoyed it immensely. It didn’t hurt that Dylan O’Brien and all his hotness TOTALLY nailed every part of this movie. It also probably doesn’t hurt that he’s so pretty. I’m not kidding. In one scene where he’s hanging from a vent and jumps down showing off his mighty fine physique, the girls behind me actually sighed out loud. SIGHED. The cranks? Terrifying. And SO GROSS. There was one point in the movie where I physically wanted to be sick. They were great! But I just don’t think they were explained enough for people who hadn’t read the books. I’m also NOT a fan of the way they minimised the role of the ‘girl group’ in the movie in comparison to the book, completely changing certain character’s actions because of it! Not cool.. not cool. While a good watch, it did often fill like a filler movie, especially the way it ended. And although it does a better job of explaining things than the book, there are still certain aspects that aren’t elaborated or delved into properly. I hope this is cleared up in the third one. Overall, I definitely recommend this movie to everyone! While you don’t have to read the books to watch it (the movies probably even explain things better than the books)… you definitely HAVE to have seen the first movie otherwise you’ll be quite confused. Maze Runner: The Scorch Trials is in cinemas across Australia now. Big thanks to Dymocks Books and Allen & Unwin for inviting me to the Sydney premiere of Me and Earl and the Dying Girl. I went into the movie with little to no idea of what this was about, but I have heard that it’s won multiple awards at the Sundance Movie Festival. People that watched it at the Sydney/Melbourne Film Festivals also had high praise for the movie, so I felt pretty positive about it going in. This film is produced by the same people who did Juno and (500) Days of Summer. This means that you can expect it to be very, very quirky. I enjoyed Juno a lot back in the days, but 500 Days of Summer? Ugh, is all I can say. Me and Earl and the Dying Girl follows Greg, who’s in his senior year of high school. He’s a bit of a weird one; liked by everyone at school as he shares just enough of himself to be liked, but never gets in too deep with any one group. He believes that he has no friends, despite having grown up with Earl from a very young age. In the middle of the school year, Greg finds out that a girl he knows — Rachel — has cancer, and is forced by his mum to hang out with her. Greg and Earl appear on Rachel’s doorstep after accidentally getting high one day at school, and to Rachel’s bemusement, they soon start hanging out with each other more and more often. The friendship is brought together by the multiple amateur parody films that Earl and Greg have been making from a young age, which Earl accidentally tells Rachel about. Of course, they couldn’t refuse a dying girl when she asks to watch them. Everyone in the town was just so…unique. So much so that it felt a little too forced to me. There’s the macho history teacher, Rachel’s overly sexual mum, weird goth kid that is too into steampunk, Greg’s sociology teacher dad that likes to eat the weirdest crap and many more. Everyone was just so quirky. That’s not a bad thing, and if you like characters like this, then Me and Earl and the Dying Girl is definitely the movie for you. But if you’re like me and prefer action movies more, then probably stick to those. The plot was a little slow/non-existent, revolving around Rachel’s treatment and Greg and Earl’s attempt to make her her own movie. There’s some nice themes about friendship and appreciating what you have in life, which makes for a cute high school story. If you like the sound of that, then this is definitely the right movie for you! Me and Earl and the Dying Girl is in cinemas across Australia on the 3 September 2015. Thanks to Jaz @ Fiction in Fiction in Fiction, I was lucky enough to attend the Australian premiere of Paper Towns, last Sunday. It was crazzzzy town when we arrived at the red carpet event, there was so many tweens screaming their heads off because guess what … CARA DELEVIGNE WAS THERE. Cara helped open Paper Towns to the cinemas, had a brief interview on stage and then made the whole cinema get up so she could film a dub smash. It was actually pretty hilarious seeing everyone from the tweens to older men waving their arms in the air and then freezing at a certain point in the song. Paper Towns was one of those movies where I didn’t pay all that much attention to (I know, I know – what kind of blogger are you?!). I honestly didn’t have the time to read the book, and had only watched the trailer one or two times. It looked good — but it wasn’t something that I was fangirling over day in, day out. I went into the movie with no expectations — you see, I was one of the minority when it came to TFIOS, I found the movie so much better than the book — but I had a feeling that it would be quite good regardless. John Green’s writing is not exactly right for me. It’s a little too flowery and doesn’t exactly stand out. His books do not exactly scream at me to pick them up, despite their popularity. Perhaps that’s it, the hype just never quite meet my expectations when it comes to his books. But you know what, this is the second movie adaption of a John Green book that I’ve seen, and I must say … they really, really good. Like, SO GOOD. The cinematography is well done, the casting choices feel pretty spot on (the actors actually LOOK like teenagers), and the screenwriting? It’s absolutely amazing because it’s not over the top John Greeny. Does that even make sense? I feel like all the boring parts are removed from the script so only the important parts are focussed on. You know when you wish when certain parts in a book was removed? Well that’s what’s great about these adaptations — they do just that. And Paper Towns was an absolute delight to watch. I might be a little bias here but Cara was an absolute stunner. She played the enigmatic Margot Roth Spiegelman amazingly, and I was sad that she didn’t actually have all that much screen time. Despite that, she played the role of the mysterious — yet lost — girl wonderfully. However, the standout star of the movie would have to be Nat Wolff’s Q. In love with Margot since childhood, Q finally sees a chance to show Margot his true feelings on the eve of her disappearance. He’s the last person to have seen her, having spent the night with Margot pulling a series of revenge acts on the people that have betrayed her. When though she’s gone, she had a strong hold over Q, and this seems to heighten when he discovers a series of clues that she’s left behind for him to find her. Q and his best friends embark on a final road trip to find Margot Roth Spiegelman — a final journey together before they all go their separate ways to college. Paper Towns was a movie that captivated my attention from beginning to end. I loved the friendships, the quirkiness of the characters, and the overarching message of the film. Actually, there were several; in order to find yourself, you have to open up yourself to new experiences; don’t throw away your friendships for anyone; enjoy the moment, it’s only there once; and not every story ends with a happily ever after. I really like that last one because it highlights just how realistic the story is. Kudos to John Green for understanding and showcasing life’s realities in such a prominent way. Overall a very, very good movie, and one that will definitely keep fans and newbies hooked till the end. Paper Towns is in cinemas on the 16th July 2015 across Australia. Mockingjay Part 1 Sydney Premiere! Hey guys, happy Monday! So last week, I entered a competition for exclusive tickets to the premiere of Mockingjay Part 1 in Sydney. To my surprise, I won (may have screamed and danced around a little)! So I’m here to bring you an exclusive early review of the movie, just incase you’re still debating whether to watch it (why?!). Thank you so much to Roadshow Films for the tickets, you guys are the bomb! Most readers of the series will find themselves doubting this third installment. I know I did. If you’ve read Mockingjay, then you’ll know that almost nothing happens in the first half of the book, so can you really blame me for cringing when it was announced that Mockingjay would be split into two? Of course that didn’t stop me from anticipating the film, although at the back of my mind I was continuously wondering how they could make ‘nothing’ into ‘something’. I’m happy to say Mockingjay Part 1 was everything I hoped it’d be and more. Catching Fire saw Katniss Everdeen shatter the games, and Mockingjay P1 sees her coming to terms with the aftermath of the world following the destruction of her district. Jennifer Lawrence gives her best performance of Katniss yet, and we get to see a much darker and morbid storyline as the nation of Panem starts a revolution against the Capitol. If you thought the first two films had a lot of death … wait till you watch this movie. Mockingjay Pt 1 will have you sitting on the edge of your seat. More than once I found my heart beating out of my chest due to the suspense. I knew what the outcome was, but still, in that moment you can’t help but think the worst. What the film does better than the book is create an intense atmosphere where even the most avid fan will wonder about the outcome. The film also fleshes out parts of the story that occurs behind the scenes, like the rescue of the tributes from the Capitol. Usually I’m not a fan of inserting events that are not witnessed by the protagonist (eg. The Hobbit films) in order to extend the movie and make movie-goers fork out more money, but I must say that it worked extremely well with Mockingjay Pt 1. The length of the film is much shorter than the previous two, but it works well because it does not drag on unnecessarily. The cast is once again brilliant. Aside from Jennifer who’s once again a badass (and can do no wrong in my eyes), Josh’s portrayal of Peeta Mellark is on point as well. Taken by the Capitol, Peeta does what he can in order to survive and without knowledge of what happened to his district or Katniss. Liam Hemsworth’s Gale plays a much bigger role in this film as we see him participating in military efforts to protect Katniss and rescue the missing tributes taken by the Capitol. There are also new additions to the team, with Natalie Dormer’s Cressida being another standout character (I love Natalie Dormer as well so I might be pretty bias here). While I was not a fan of President Coin in the books, Julianne Moore’s performance was brilliant and depicted Coin so well. As the leader of District 13, she has the responsibility in making hard choices in order to keep her people alive all the while running a revolution. It’s a tough job and I don’t envy her for it at all. Coin and Effie have a few run-ins that provide some comical relief in a movie that’s filled with heartbreak and death. And now onto the much debated ‘split’ of the film. I don’t remember all too much from the book so I can’t say whether it lands right in the middle or not. However, I found it worked extremely well and left off on another cliffhanger-ish moment with someone strapped to a hospital bed. I will leave it at that because I don’t want to spoil the ending for anyone, but the split has my full approval because now I know what the second half of the film will be dedicated to. Mockingjay Pt 1 deserves ALL THE STARS I can give it plus more. These films are as true to the books as an adaptation can be, and even improves upon it in some areas. You do not want to miss this next installment – book your tickets asap! Thank you so much to Roadshow Films for the premiere tickets again! Catch Mockingjay Part 1 around Australia from the 20th November 2014. Thanks to Hachette Australia, I was one of the lucky ones to have won tickets to the Gone Girl exclusive premiere in Sydney last night. I picked up the book last week and had just completed it on Tuesday before the movie. I will have a review up for the book soon but let me just say … it was a royal mindscrew. But, I did enjoy it overall. I dragged my boyfriend along yesterday night and warned him that the movie will scar him about marriage. This was actually one of the movies we both really wanted to see, so I was eager to gauge his reaction. Let’s just say he was thoroughly scarred, which I take as a good reaction because this movie isn’t just a mystery, but a psychological thriller at its root. 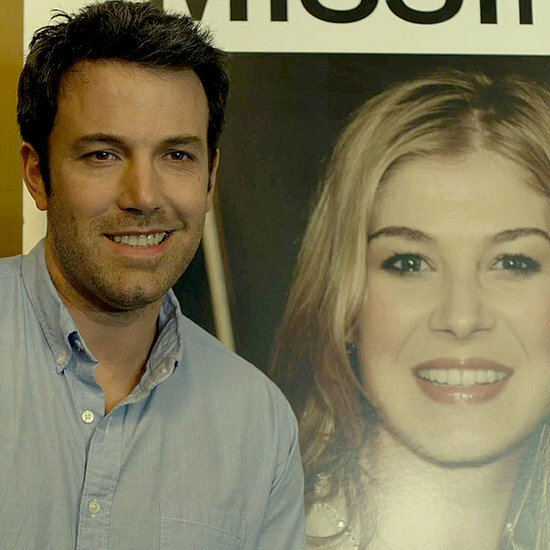 Gone Girl follows a man named Nick Dunne (Ben Affleck) whose wife Amy (Rosamund Pike) disappears on their fifth anniversary. He comes home to find the door left wide open, the iron left on and the living room showing signs of a struggle. First thing he does is alert the police … but Nick is missing an alibi, and the crime scene looks suspiciously like one of a homicide. Every clue that the police finds suggests Nick is the culprit, but as he follows the anniversary treasure hunt clues left behind by Amy, a different story seems to unfold. And it suggests that Amy might actually be alive. Ben Affleck plays the Nick that I had imagined in my mind. His awkward posture and stoic face perfectly portrays the character that Nick is described as. A man that worries about how people think of him. A man who does not do well under pressure, and doesn’t act like the worried husband that people expect him to be. And the media latches on to his odd behaviour because it’s an angle that sells. And let’s not forget how in most missing women cases, the husband always seems to be the guilty culprit. Our society jumps to conclusions because it’s easy to blame someone, and the media certainly doesn’t help in that aspect. As a media student, I found it so fascinating how a simple story can be twisted just so to paint someone as guilty or innocent. Everyone wants a story that sells, and it’s disgusting the way the media does it because they are essentially toying with a person’s life. This film will open up your eyes to the media and its news – never take the news as it is, always ask questions, and always do your research. Aside from Affleck, this movie is filled with amazing actors that portray their characters to a tee. Rosamund Pike was the (Amazing) Amy I pictured and she was able to show a distinct swing between loving, scared, worried and crazy perfectly. Every character in this movie is completely flawed, but realistic. You might argue this realism once you’ve seen the movie, but from a psychological point-of-view these people exist. They might not be of the norm, but they exist out in our world, and what’s scary is they can act just like you or I. As an adaption, this movie is very true to the book, thanks mainly to the fact that Gillian Flynn was also the screenwriter for the movie. Of course, certain events and scenes are glossed over due to the time frame but this doesn’t detract from the movie at all. Readers of the books might find it annoying that certain twists and crucial scenes are skipped over altogether though. I would suggest you to not reread/read the book prior to watching this movie for the full impact of the story. I’m happy to say that the ending has not changed. The ending to the book was infuriating, but I liked it all the same because it was just different and realistic to the story. I know a lot of people hated the ending, so I’m aware that a majority will leave the cinemas furious as well. I will just say that I was happy with the ending, and leave the rest for you to judge. Overall this movie deserves from high praise for its actors’ portrayals of Gillian Flynn’s characters. They were so on-par that I almost believed they were real. I recommend this movie to all lovers of mystery and psychological thrillers, but it’s not for the squirmish or the weak-of-heart. First Date Potential: Not unless you want them to seek therapy. Last week I was lucky enough to win a double pass to The Maze Runner thanks to Dymocks Australia. Having devoured The Maze Runner by James Dashner and its two sequels last weekend, I was eagerly anticipating this book-to-film adaption to be released. Not only for the actors, *cough* Dylan O’Brien *cough* but also because it was a damn good book. For those of you who haven’t read the bestselling YA novel and have no idea what on earth this movie is about… here’s the sitch. Think Lord Of The Flies meets The Hunger Games in this dystopian tale of friendship, survival and death. Thomas is the latest arrival to a community of teenage boys who have all been deposited by elevator, once a month, into a small forest known as ‘The Glade’. Knowing nothing of the past but their name, the boys have spent the last two years searching the Maze that surrounds them for an escape or for some clue of who put them there and why. Only able to search by day, the chosen ‘runners’ must make it through the Maze and back before dusk or else the horrifying ‘Grievers’ will tear them limb from limb. The boys have begun to lose all hope of escape until the arrival of a comatose girl, Theresa, which sparks an irreversible change in their world. The Maze Runner is gripping, violent and intense. The fast paced action sequences were executed amazingly and the general scenery of the film was really well done. Director Wes Ball has clearly made a valiant effort at following the narrative of the book, however there are quite a few changes. Admittedly, these changes do make more sense when you consider the time restrictions a film is under and only really serve to make the more difficult concepts easier to understand, for those who haven’t read the book. Dylan O’Brien was the PERFECT Thomas. I promise I’m being as unbiased as possible here, but seriously, his acting was unbelievably impressive as he successfully managed to clearly depict the turmoil, confusion and curiosity of the book Thomas. And LORD he must have had to train so hard for this movie… all that running! Dylan’s co-stars were equally impressive. From Will Poulter as Gally to Aml Ameen as Alby and Ki Hong Lee as Minho… this film is exceptionally well cast and each actor does their character justice. My one qualm would be the depiction of Theresa played by Kaya Scodelario although I’m not sure if it’s her acting or more about the way she’s been written. (I’ll leave that for you to decide) In the book she seemed (in my opinion) to be lot more tough and assertive, but in the film she was much more passive. This was a definite disappointment as I feel like the film trivalised her role to the point where it felt like she was a minor character. I could talk a lot more about the changes they made… but I won’t because I’ll either bore everyone or spoil the movie for those who haven’t read the book…and we don’t want either of those to happen! Overall I really loved the movie. However, I feel like I would have liked it more if I hadn’t read the book so close to watching the movie. I just couldn’t get past the changes they had made… even if they were for the better. I’d definitely recommend everyone go see it if they get a chance… it’s two hours of pure dystopian fun, a fantastic plot and very good looking boys. What more could you want in a movie? This is definitely going to be the next big blockbuster and I really hope it does well… we need them to make The Scorch Trials! Thanks to Dymocks Australia for the double pass to see The Maze Runner. What are your thoughts about the movie? Are you guys interested to see it? If you’ve seen The Maze Runner already, what did you think? Did you like the changes they made? I had a hard choice before me, but thanks to Jeann and Rachael Craw‘s helpful input, I decided to hand my Giver tickets over to a friend and meet Laini Taylor instead! My lovely friend Lisa was nice enough to help me out by attending the screening and reviewing the movie for the blog. She’s a professional journalist, and did a spectacular job of course. Read on for Lisa’s review!